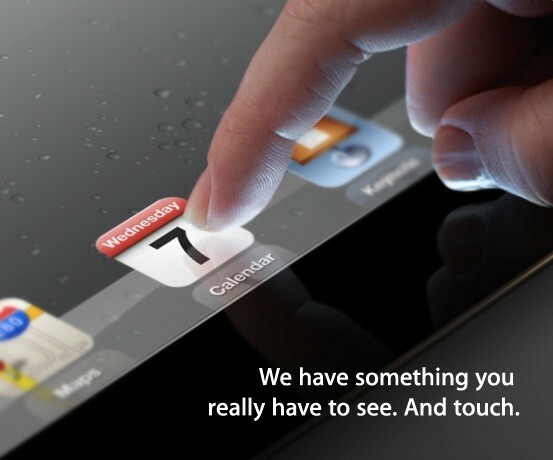 Apple has confirmed the date for the next iPad event, and that is going to be March 7th 2012. The event is going to be taken place at San Francisco. Things are being kept mostly under cover, as the company teases the news craving people and gadget savvy ones with the note “something you really have to see. And touch.”. Earlier it was rumored that 24th February, Steve Jobs birth anniversary would be the good date for the launch, but now its confirmed as 7th March. The next iPad could be the iPad 3, the iPad 2S or something else. But we are sure that it is something big, something really innovative and Apple has never left the users disappointed when it comes with the iPad upgrade. The iPad 2 was a lot better than the first generation one, so we are not expecting just the connectivity upgrade but many other things in the next release. What we predict is the 4G LTE connectivity, something close to the retina display, and the upgrades in the camera.